The U.S. Department of Energy’s (DOE) Office of Science announced 62 projects for 2019 aimed at accelerating discovery and innovation to address some of the world’s most challenging science problems through its Innovative and Novel Computational Impact on Theory and Experiment (INCITE) program. Deploying on supercomputers that rank among the country’s most powerful, the projects originate in national laboratories, academia, and industry, and encompass a remarkable range of scientific inquiry. The awards allocate the resources of the DOE Leadership Computing Facilities at DOE’s Argonne and Oak Ridge National Laboratories. The two centers jointly manage the INCITE program as a principal conduit for their dedication to open science. As the primary means to access the facilities’ computing resources, INCITE proposals are awarded on a highly competitive basis. Projects span disciplines ranging from high-energy physics and materials science to biochemistry and engineering. Computational and domain scientists at the facilities partner with investigators to develop new computational methods, assist and optimize code development, streamline workflows, analyze and visualize data, and troubleshoot glitches. The INCITE program commenced in 2004 with three inaugural projects totaling five million core hours. Since then, the ALCF and OLCF have continuously undergone significant upgrades to retain their edge in facilitating the most computationally demanding scientific projects. The ALCF’s most recent machine is Theta, an 11.69-petaflop Cray XC40 system with 280,000-plus cores to make it ideal for research at the nexus of simulation, data science, and machine learning. An even more powerful system, the exascale Aurora, is planned for deployment in 2021 and is projected to be capable of a quintillion (one billion billion) calculations per second. Alexander Tchekhovskoy from Northwestern University received 850,000 Summit node-hours to address two longstanding mysteries in astrophysics: how neutron star collisions produce heavy elements like gold and platinum, and how black holes break up red-hot disks of gas feeding them. Sean Dettrick from TAE Technologies received 750,000 Theta node-hours to perform simulations that will accelerate the company’s experimental research program in the magnetic confinement of plasmas, with the goal of creating a clean, commercially viable, fusion-based electricity generator. Ron Dror from Stanford University received 4,540,000 Titan node-hours and 400,000 Summit node-hours to reveal how drug receptors select which signaling proteins to activate so as to enable the development of finely tuned medicines that yield desired effects with fewer side effects. 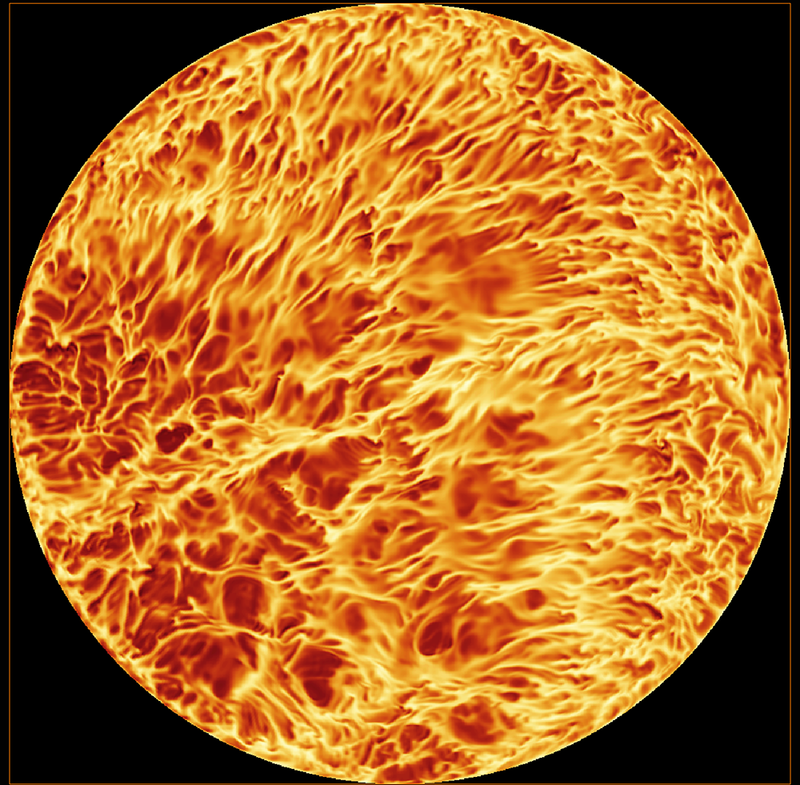 Janet Scheel from Occidental College received 12,500,000 Mira node-hours to simulate turbulent heated convection in air at the highest Rayleigh numbers ever obtained in a direct numerical simulation. The results will shed light on the ultimate regime of convective turbulence where there should be significantly enhanced heat transport. Dario Alfe from University College London received 1,210,000 Titan node-hours and 40,000 Summit node-hours to perform quantum Monte Carlo simulations that will provide high-accuracy data for the adsorption of water on graphene. This data will have applications in water purification, desalinisation and drug delivery. Aleksandr Obabko from Argonne received 17,700,000 Mira node-hours for thermal-hydraulics simulations of nuclear reactors to enable better reactor designs. Occidental College researcher Janet Scheel will use ALCF computing resources for her 2019 INCITE project “Towards Ultimate Rayleigh-Benard Convection.” This image shows temperatures (dark red corresponds to higher temperature and white to lower temperatures) near the bottom plate for Rayleigh-Benard Convection flow in a cylindrical container. Turbulent convection is an important area of research in fluid dynamics with applications to diverse phenomena in nature and technology, ranging from chip cooling devices and heat exchangers in power plants to convection in the Earth’s atmosphere, core, and oceans.